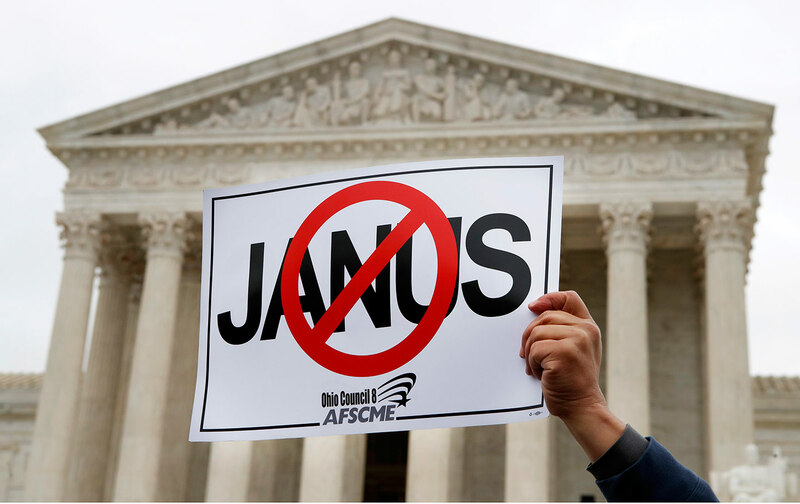 Organized labor has taken brutal hits from policy-makers and judges over the course of the past decade, and Wednesday’s US Supreme Court decision in the case of Janus v. American Federation of State, County, and Municipal Employees, Council 31 strikes serious new blows. By abandoning a 41-year-old precedent that permitted public-sector unions to levy fair-share fees on workers whose interests the unions have long represented, the Court takes aim at the treasuries of unions that need resources to engage in collective bargaining and to assure that public services are not threatened by cuts in funding and privatization schemes. The decision, handed down on the same day that Justice Anthony Kennedy announced his retirement, guarantees that the makeup of the Supreme Court will be a central issue—perhaps the central issue—of the 2018 election cycle. Never as moderate as some court watchers imagined, Kennedy was a member of the anti-union majority in the Janus case. But his departure on July 31 will give President Trump an opportunity to move the court to the right on economic and social issues. The fight to prevent that shift will require Democrats to be far bolder than they were in the struggle to block the confirmation of Trump’s first nominee, Justice Neil Gorsuch. That fight will focus a great deal of attention on concerns about abortion rights and affirmative action, two issues on which Kennedy broke with his more conservative colleagues. But the damage that a Trump-defined Supreme Court can do extends to every issue. With the ‘Janus’ decision, the Supreme Court majority delivered for the Koch brothers and their Republican allies. The threat to workers will be especially serious, as the Janus decision illustrates. Organized labor has for the better part of a century been the most effective proponent of a politics that takes into account the concerns of working people—those who join unions and those who simply benefit from the advances in pay, benefits, and workplace protections that are achieved through collective bargaining and collective action. That does not mean that unions are always so right or as effective as they should be. But it does mean that they have provided a vital counterbalance to the often overwhelming influence of billionaire CEOs, multinational corporations, and big banks on our politics and our governance. This counterbalance has historically benefited the political aspirations of pro-worker Democrats and a good many Republicans—who in the days of Abraham Lincoln, Teddy Roosevelt, and Dwight Eisenhower still displayed a good deal of skepticism with regard to corporate power. As the Grand Old Party has in recent decades embraced a crony-capitalist vision for achieving and retaining power—along with the anti-union zealotry that goes with it—Republican presidents and congresses have abandoned their better instincts, especially when it comes to selecting Supreme Court nominees. It is no secret that GOP nominees for lifetime sinecures on the nation’s highest court have for many years now been chosen with the purpose of achieving political ends. They are nominated and confirmed not with the hope of securing justice but with a win-at-any-cost focus on aiding the interests of electoral allies and, in so doing, on satisfying the demands of donors to the campaigns of those allies. This extends across a wide spectrum of cases that the Court has decided in recent years, from those involving voter purges to gerrymandering to campaign-finance rules. But it is particularly evident in cases involving labor rights. The Janus decision must be seen in this context. The Court majority is legislating from the bench. To this end, a narrow majority of justices has made a calculated political intervention that harms the interests of public-sector workers while also making it harder for the unions that represent those workers to assure that public services are maintained. The purpose of the advocates for the position that has been embraces by the Court is to threaten the viability of unions that have already been attacked by governors such as Wisconsin’s Scott Walker and Michigan’s Rick Snyder, and that are under constant assault from the elaborate political networks that have been established and maintained by the Koch brothers. On Wednesday, the ATU and other unions, such as the American Federation of Teachers, highlighted “I’m Sticking With My Union” messages. “While today the thirst for power trumped the aspirations and needs of communities and the people who serve them—workers are sticking with the union because unions are still the best vehicle working people have to get ahead,” argued AFT president Randi Weingarten on Twitter. The Janus decision also demands something of the great mass of Americans, no matter what their affiliation may or may not be with organized labor. With the Janus decision, Chief Justice John Roberts and Justices Samuel Alito, Clarence Thomas, Gorsuch, and Kennedy placed their thumbs on the scale and tipped the balance in workplaces across the country. They also influenced the broader politics of cities, states, and the nation. If the great mass of Americans who are not card-carrying oligarchs want a politics that is defined by real competition between differing ideals and visions for our future, if they seek alternatives to crony capitalism and the dictates of the billionaire class, then voters must make their own demands of candidates for the US Senate, and ultimately for the presidency. There can be no more compromises with regard to the makeup of the nation’s highest court. The battle over the Kennedy seat will be the first fight. But it will not stop there. The fall election fight for control of the US Senate, already vital, will now matter more. The Senate must be transformed into something nobler than the partisan swamp that Mitch McConnell and his allies have made it. The machinations that prevented then–President Barack Obama from filling a Supreme Court vacancy in 2016 with a qualified and responsible jurist, Judge Merrick Garland, can never be repeated. The system of checks and balances must be sufficiently renewed so that Supreme Court nominees who are clearly aligned with billionaire interests and the political program that those interests demand, such as Gorsuch, will face proper scrutiny. The Court and its makeup has to become an overarching issue of our politics in 2018 and beyond. Indeed, the Court and its makeup must be understood as the issue that touches all others—because when corporate-aligned justices tip the balance of our politics in favor or their partisan allies, as they did with the Janus decision and too many other recent decisions involving the rights of workers to make their voices heard, and as they will do at every opportunity in the future, these judicial activists on behalf of crony capitalism do not merely threaten unions or the Democratic Party. They threaten the basic functioning of American democracy as the competition of ideas and interests that it must be.